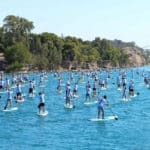 Take part in one of the most breathtaking SUP races in the world - The Corinth Canal SUP Race in Greece. One of the most spectacular stand up paddle races in the world is now open for registrations. The race takes place in the Corinth Canal which connects the Gulf of Corinth with the Saronic Gulf in the Aegean Sea. It cuts through the narrow Isthmus of Corinth and separates the Peloponnese from the Greek mainland. The canal was dug through the Isthmus at sea level and has no locks. It is 6.4 kilometres (4 mi) in length and only 21.4 metres (70 ft) wide at its base making it a perfect and totally breathtaking SUP race track. On Sunday September 30th 2018, the naval traffic of the canal will be stopped by AEDIK, for 300 and more Stand Up Paddlers to compete at the “World’s Straightest SUP Race”. 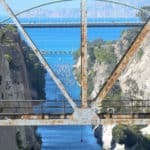 Over 300 competitors will race through the Corinth Canal. 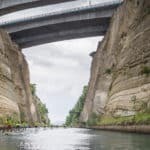 Racing through the Corinth canal. 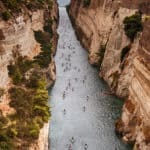 For 8 consecutive years, the “CORINTH CANAL SUP CROSSING” race (formerly known as “Isthmus Speed Crossing”) has been the most interesting for paddlers all around Europe and the Globe, who travel to Greece for this opportunity. Previous articleGB SUP and Paddleboard Team 2018 announced.